Although no Sandra Lee vegetarian quiche variety has hit the big time yet, Sandra's semi-homemade recipes are easy to adapt for people who don't eat meat. Whether you choose to use a meat substitute to round out the flavor of the dishes or fill up the savory pies with even more veggies, the end result can be just as tasty and simple as the original meat version. Sandra Lee is all about semi-homemade food that strikes a balance between convenience and taste. She's the author of Semi-Homemade: The Complete Cookbook, Cocktail Time, Weeknight Wonders, and Money Saving Slow Cooking. Sandra also publishes a magazine and hosts two shows on the Food Network. 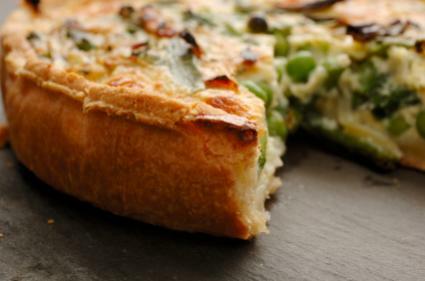 A Sandra Lee vegetarian quiche recipe caters to people with busy schedules who want to eat homemade food with wholesome ingredients but don't have the time or the desire to prepare everything from scratch. Sandra uses popular ingredients that are crowd pleasers and that most people are likely to have in their refrigerators and pantries. The Food Network website shares two of Sandra Lee's quiche recipes, one with bacon and mushrooms and another with ham and cheese. Vegetarians and vegans should feel free to adapt her simple recipes to suit their diets. The recipe is simple to follow and produces big flavor thanks to freshly chopped thyme and parsley. Sandra suggests using a pre-made, frozen piecrust to save time and labor. Again, Sandra calls for a pre-made, frozen pie crust, which shortens prep time for the dish. To make the end product healthier, use skim milk, a low-fat cheese blend, and a low-fat meat substitute. When you fill a veggie quiche with high-quality, flavorful ingredients, even meat lovers aren't likely to notice any missing ham or bacon. A Sandra Lee recipe is already tried and true, so it isn't likely to need many adjustments, but keep your own preferences in mind. If you like a richer, full-flavored quiche, substitute milk with heavy cream. Similarly, if you'd like to shave off some calories, use skim milk. Add sautéed spinach or other leafy greens to any Sandra Lee quiche to bump up its nutritional value and add more veggie variety. Use Sandra's cheese ingredients as suggestions. If you prefer the taste of feta or cheddar in quiche rather than the cheese she requests, substitute at will. Another option is to use a blend of your favorite cheeses. Make a lighter, fluffier quiche by using more egg whites than full eggs. Dislike the flavor of premade pie crust? Don't use it! Make your own instead. Use a mixture of butter and vegetable shortening to get a flaky crust with a rich, savory flavor. Lay thin tomato slices or sun-dried tomato halves on top of your quiche before baking to enhance the visual appeal of the finished dish. When your quiche cools, serve it with a fresh fruit salad, a spring green mix, steamed vegetables or slices of toast. Leftovers last well in the refrigerator for up to several days. 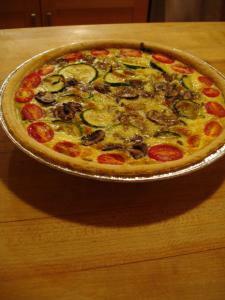 Quiche can also be prepared in advance and frozen before it's baked. When you need a hot meal, simply take it out of the freezer, thaw, and bake as usual.